Ed Hardy, the renowned American tattoo artist, who was born in Iowa and grew up in Southern California, is known for the flair he infuses into his fantastic tattoo designs. No longer actively involved with doing tattoos, Hardy has turned his exceptional talent into other fields where his designs can be enjoyed by all. 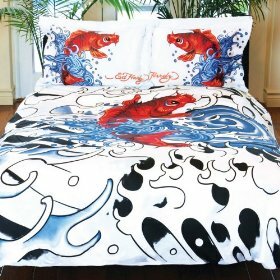 Ed Hardy tattoo designs can be found on clothing, wallets and bags, and of course his range of beautiful and striking bedding. His patterns have translated exceptionally well into his bedding range which displays bright, bold, colorful designs, often featuring skulls interwoven with vines. Hardy incorporates Japanese techniques such as is shown in the Koi bedding set and pop art culture into his great looking bedding designs. Ed Hardy bedding is available in twin, full and queens sizes and you can choose from such styles as the fabulous hot pink ‘Love Kills Slowly’ bedding set, the funky ‘Mermaid’ set and many others that are equally suited for the main bedroom or the teens bedroom. 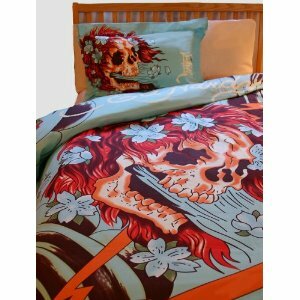 Anyone who is a fan of the Ed Hardy tattoo design bedding will enjoy having one of these great looking sets in their bedroom. 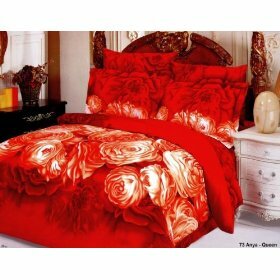 You can buy one of these fabulous bedding sets by simply clicking on the picture. Just another amazing design by Ed Hardy. 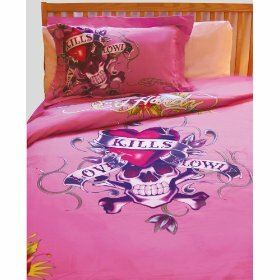 The Ed Hardy Love Kills Slowly Duvet Set features a skull shrouded by vines and lotus flowers as the centerpiece, on a background of bright pink. The Ed Hardy signature features along the top of the comforter. This spectacular design is achieve by the use of a 12 screen digital printing process. The duvet set is printed on 300 count cotton sateen. This duvet set gets softer the more its washed. This set is a must for any Ed Hardy fan. For those who aren’t aware of who Ed Hardy is, he is a former tattoo artist from Iowa who incorporated Japanese style designs and technique into his work. The duvet set comes to you in a beautifully decorated, reusable Ed Hardy box. Lots of positive comments were made about the Biltmore Estate Sophia 300-Thread-Count Duvet Set , including those that register surprise about correct size. Many reviewers were not expecting to get Duvets that would actually fit their beds perfectly—they were expecting them to be off by a couple of inches or so. Yet the Duvet Set repeatedly proved to be just the right size each and every time, much to the delight of consumers who purchased it. Several reviewers even pointed out that the duvet was actually made out of Egyptian cotton, and that it was a pleasant surprise, as the product description didn’t point it out. Nearly every review raved over the fact that their oversized comforters fit neatly in the duvet, even up to the largest oversized king comforters. Most of the reviews appreciated the quality of the product for the price, and mentioned the softness of the set as well. The few complaints had to do with the expected color VS the actual product, but these were balanced by an equal number that felt theirs was just right. A few customers mentioned they picked the product specifically because of other good experiences with Biltmore sets, and one also mentioned that they ended up buying two because they liked them so much. 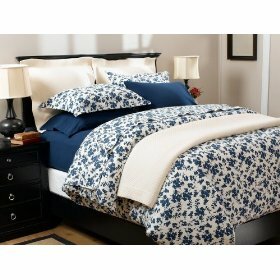 The comforter set comes with two coordinating pillow shams. Overall, a solid thumbs up from 90% of reviewers. 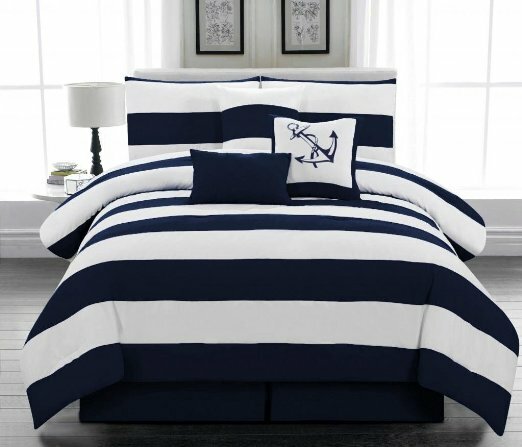 Create a clean, refreshing, seaside style in your bedroom with the soothing tones of the Cabana Blue Striped Comforter Cover Bedding Set . and a neck roll pillow to decorate the bed with. This set is great value for money. 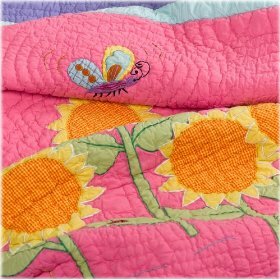 The Freckles Butterfly Garden Quilt has been designed to appeal to little girls who are moving from a crib to a bed and they will be captivated by this beautiful pink quilt with its brightly colored butterflies and bright yellow sunflowers. The pink quilt has a sky blue and lavender trim surround which nicely sets off the center panel. Freckles get it right every time when it comes to childrens bedding and this set is no exception. The quilt is hand stitched and is part of the Freckles Butterfly Garden Bedding Collection which has the coordinating sheet sets, decorative pillows, lamp shades, drapes, rugs and other bright and beautiful accessories, which will give the room a totally coordinated look. This warm quilt is made from 100% cotton so it is machine washable making it easy to care for. You can purchase this quilt in twin, full and queen sizes and it is equally at home in a tween or teen room. The twin quilt measures 66 x 86 inches and the full/queen sized quilts measure 86 x 86 inches. The delightful pattern was designed in Australia. 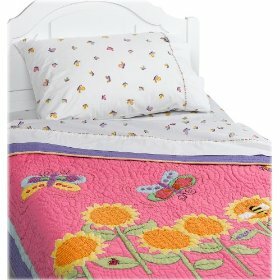 Where Can I Read the Reviews & Buy the Freckles Butterfly Garden Quilt & Accessories? Simple yet effective, Pinzon-160 Gram Printed Flannel Duvet Covers have earned a high satisfactory rating from purchasers. These reviews primarily highlighted the amazingly soft Portuguese flannel, which does not have the rough feel of many other flannel bedding products. These customers enjoyed the high quality of these duvet covers, as the material did not pill after washing them (often, previous experience with flannel products led them to expect pilling). This positive feature allows the duvet covers to maintain their color and appearance for a much longer time than traditional bedding sets. These cozy cotton flannel duvet covers have a pretty floral silhouette pattern printed on the fabric which will mix an match beautifully with all Pinzon flannel, yarn dyed flannel and velvet bedding. The covers have been pre-washed and lightly brushed giving you a soft warm feeling when you hop into bed and the fabric brushes against your skin. These duvet covers have been expertly made in Portugal in the town of Guimaraes which is where the castle of the first king of Portugal is situated. 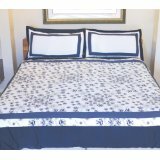 The full/queen duvet measures 86 by 86 inches and has hidden button closure, on which one person commented that the buttons on their duvet were difficult to push through the buttonholes. This may have been a one off problem but purchasers with arthritis may like to keep this in mind when considering this product. The warmth of the cover and the appreciation of the softness seemed to outweigh this difficulty, however. One customer reported that the appearance of the product in the picture was a stark white and black pattern, but when the duvet covers were received, they were more cream colored than white. If you are attempting to match the color scheme of the duvet covers to the rest of your bedroom, look very closely at the pictures before making a decision. 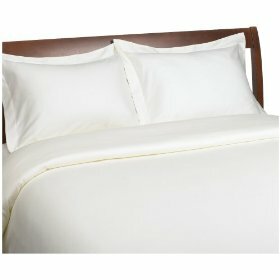 Most of the customers reviewed were very happy with the unique floral design, thickness, and softness of these duvet covers. 7 out of 8 customers agree that their money was well spent, as the duvet cover is well worth the money for such superior quality. Where Can I Buy Pinzon-160 Gram Printed Flannel Duvet Covers?